For many years we have enjoyed making traditional handmade hardwood furniture and woollen crafts mainly as a hobby but often as gifts for friends and family. Some of the larger items take several weeks to craft by hand and it gives us much pleasure to see the expressions of delight on the faces of recipients. Much to our amazement our works began to be sold in galleries and we were delighted that small pieces of furniture that gave us so much pleasure in the making were providing equal delight to the purchasers. We were always being asked why we did not have a website to bring our work to a wider market. Not only were we a bit daunted by today's information technology but we only had the ability to complete a limited number of pieces in available time. We make traditional bespoke hardwood furniture provided it is within our skill level and the limitations of our workshop size. 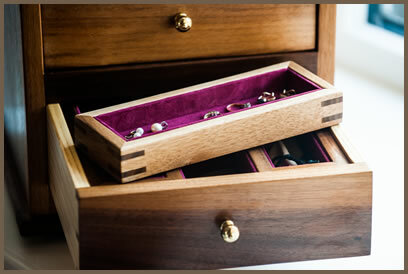 Small hardwood boxes are a real pleasure to fashion and lined with suede they provide lovely containers for cherished jewellery and 'that special gift'. Crochet and knitting provides soft toys, baby blankets and booties, which make ideal gifts for both new babies and mums. Large crocheted blankets are ideal for keeping the older mums among us warm. In a world of mass production we make truly bespoke furniture and boxes by hand that hopefully will be cherished and passed down for generations to come.